Comprising an ocean aquarium, a theme park, a water park, a knight-themed hotel and a spa hotel, the Europark Resort in Qihe county, Dezhou, Shandong province, is a comprehensive travel destination that is suitable for people of all ages. Our first stop in the resort was the Knight's Hotel, which impressed us with its castle-like facade and charming medieval decorations within. Across the hotel is the resort's spa hotel which has a sprawling 2,000-square-meter spa area resembling a rain forest and a 1,100-sqm hot spring swimming pool. The Europark's entertainment facilities are just as impressive. The venue boasts a collection of about 100 attractions, including the 1,200-meter-long Blue Fire roller coaster which was imported from Germany. The only one of its kind in Asia, this attraction ranks among the most popular in the park because of it speed - the roller coaster takes just three seconds to accelerate from a stationary position to 100 km per hour. While the ride may last only 53 seconds, guests can be sure that they would be left with an adrenaline rush that lasts even longer. Thrill-seekers should also check out the Big Pendulum and Canyon Rafting attractions that are guaranteed to leave their hairs on end. Visitors who are not fond of heart-stopping action could spend their time at the international circus show, flower parade and the Royal Firework Show in the park. Another notable attraction is the top-dome theater that offers a virtual flying tour for visitors every day. Visitors are taken 15 meters into the air as they take in the sights projected onto a giant 3D screen. A group of well-trained Mongolian horsemen demonstrating various acrobatic feats on horses is also an eye-opening experience. This show features the recreation of an ancient horse battle that tells the story of Mongolian hero Genghis Khan and his men fighting against their enemies. Located right next to Europark, the 1-billion-yuan (US$157 million) water park is an ideal place for families to bond during the summer. 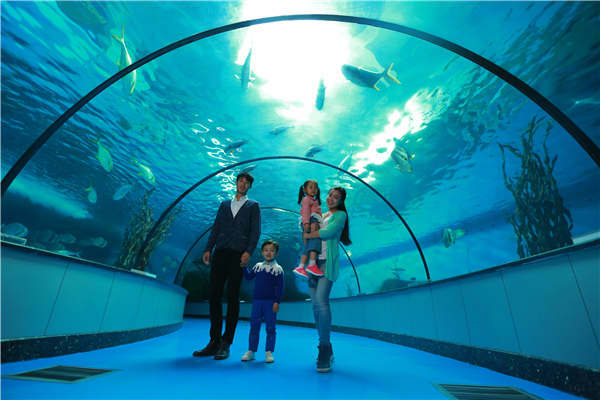 One of the largest indoor aquariums in the world, the facility is home to hundreds of aquatic species from all over the world and features more than 10 attractions, including a tropical rain forest, an underwater tunnel, a polar animal area, a 4D cinema and an underwater theater. The 100-m underwater tunnel was a highlight as this immersive experience made us feel as if we were part of the colorful marine life surrounding us. There were even women dressed in mermaid outfits swimming alongside the fishes. Visitors can also learn more about marine life using the multi-media tools and interactive programs at the facility. Li Haifeng, chairman of the resort's parent company, said the resort will feature more themed activities during upcoming Chinese and Western festivals to attract more tourists. Address: No 8, Tourism Road of Yellow River International Bio-city, Qihe County. Transport: The resort is located a 20-min drive from downtown Jinan. Bus K 906 departs Jinan's Long Distance Transport Bus Station for the resort every 30 mins. The Europark Resort in Qihe county, Dezhou, Shandong province, is a comprehensive travel destination that is suitable for people of all ages.